My comments will actually run the gambit from Positive to negative with a bit of advice added in. First let me say that when I graduated from Hollins I was very unhappy looking back on my past 4 year there. My opinion has since shifted a great deal. Many of my problems with Hollins stem from the fact that I was unique among its students in that I was actually working my way though school. 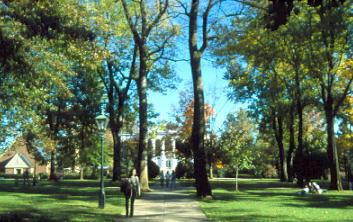 As much as I dislike playing into the stereo-typical view of Hollins as a college for girls from families with a large amount of very old money, I did have a hard time finding friends that understood the demand of working, classes and trying to meet out of class requirements for my major. That leads me to my second point…My major. I choose Theatre, a choice I still regret to this day. The theatre department is very small, and since my interest was mainly in technical theatre I sometimes felt very much on the outside. I will say that both TD's that were there in my 4 years we excellent and great to work with. Since I left I believe there has been a change in staff, so I can't speak to the current setup of the department. I would advise anyone considering a theatre major at Hollins to make sure you will be able to donate 100% of your free time above and beyond classes to the theatre department and make sure you can be active in every single production. I was also a history minor and have nothing but praise for the history department. I never had a class I didn't absolutely love and I never had a professor give less then 100%. As with most departments at Hollins, the history department has one a handful of full time faculty, but they are all amazing and wonderful professor. Also when it comes to Hollins you can't beat the Financial Aid department. All 4 years they went above and beyond to make sure I had all my college costs covered, and due to their diligence I was able to have 90% of my education paid for by scholarships and grants. Hollins is a great school and has much to offer. I can say now that I didn't take full advantage of all that was available to me. I would advise to consider your major wisely and make sure that you are able to work with the professors in the department, if I had done that I think my college experience would have been nothing but positive.